Do you need a new company identity that clearly explains what you do? Is your existing branding inconsistent or out of date? Has your business vision or target audience changed? Do you want to look more professional and stand out from your competitors? Jen Creative can help you change your branding and boost your business! I will take the time to get to know you and your business — what you offer, who your target market is and what your clients gain by working with you. I will work with you to identify what makes you stand out from your competitors and visually showcase this through your brand. My aim is to get the best from every project which can be achieved by working in partnership with you. I want you to have a brand you are proud of! I have an honest pricing policy. Costs are discussed up front with no hidden charges. I won't over commit — I promise things I can deliver on time and in budget. I've always loved being creative. As a child, my bedroom walls were adorned with my paintings and felt tip drawings. Lego bricks, Spirograph and Fimo were amongst my favourite toys. I made origami. I practiced calligraphy, which didn't make me one of the cool kids but it did start my life-long fascination with lettering and typography. By the time I was studying for GCSEs, I knew I wanted to do something creative for a career but I wasn't sure what. I lived in a small village where everyone knew everyone. Someone knew a graphic designer and a meeting was arranged. He worked in Bristol, on television graphics. It sounded like a lot of hard work but fun, creative and really exciting. I had found a professional outlet for my creativity. I was sold. After I studied graphic design at college and university, I moved to Nottingham. By this time, I'd focussed on designing for print and web. I worked in design agencies across the East Midlands for everyone from start ups to global brands. A decade later, I was ready to start my own business venture, as Jen Creative. I'd also just had my first child and realised being freelance would allow me to fit my passion for design with family life. I now live and work in Nottingham with my partner, two boys and lots of pets. Ready to chat about your requirements? Let’s arrange a call or meeting! Not quite ready to talk business? Let’s keep in touch through social media! Prim Short Stays offer high quality serviced apartments in prime locations across Nottingham city. 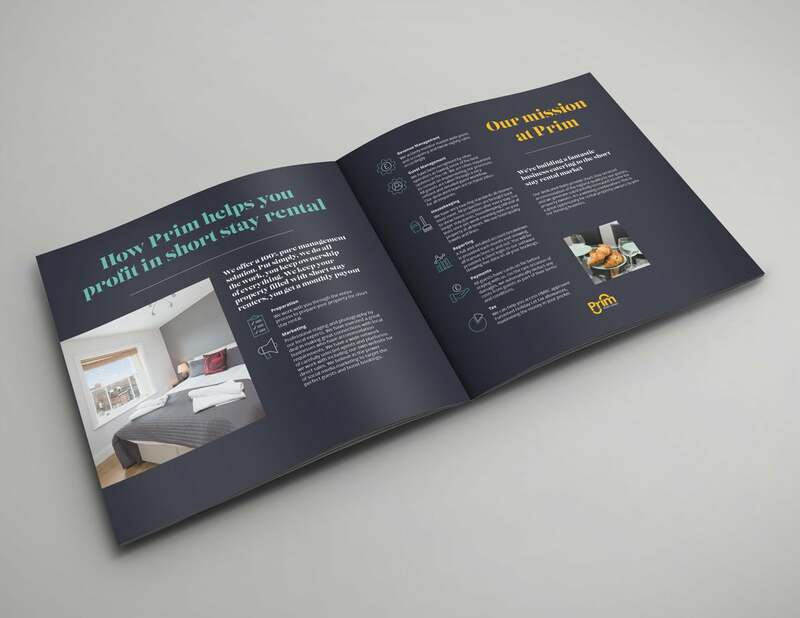 I was approached to create a brochure to demonstrate to property landlords and investors the benefits and high quality service they can expect when letting out apartments in their portfolios with Prim. To allow the high quality photography to show off the excellent finish of the apartments already under Prim's management, I used plenty of negative space. In addition, I chose a the rich, dark blue to contrast with the images and complement Prim's existing vibrant colour palette. The bright teal and yellow have been used sparingly for accents. Line art icons were designed and used in the benefits section to highlight and break up the content while adding a precise, detailed touch. Adding to the premium, desirable look, I selected a curvaceous serif typeface for headlines. 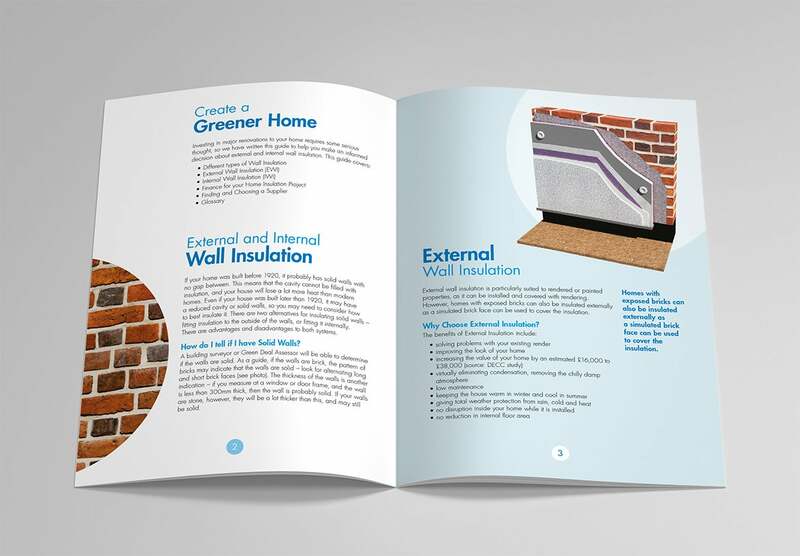 The brochure was printed on a heavy, uncoated stock to complete the luxurious feel. BEM Services provide building, mechanical and electrical infrastructure services to the construction industry. They are small but flexible and offer a wide range of services and the logo needed to reflect that. The square represents an overhead view of a building with the white spaces representing the systems BEM assist with installing and managing. The square is not closed, showing that what BEM offer is not a ‘closed box’, they are flexible. The shapes slot together harmoniously, reflecting how they work. The shapes resemble arrows pointing in all directions symbolising problem solving skills. Strong terracotta shades have been chosen as they are bold but professional. The navy blue text further enhances the feeling of professionalism and adds contrast. A solid slab serif typeface has been chosen to give a feeling of quality and structure. For the business card design, I chose to feature the logo’s colours for impact and balanced it with a secondary sans serif font and negative space. 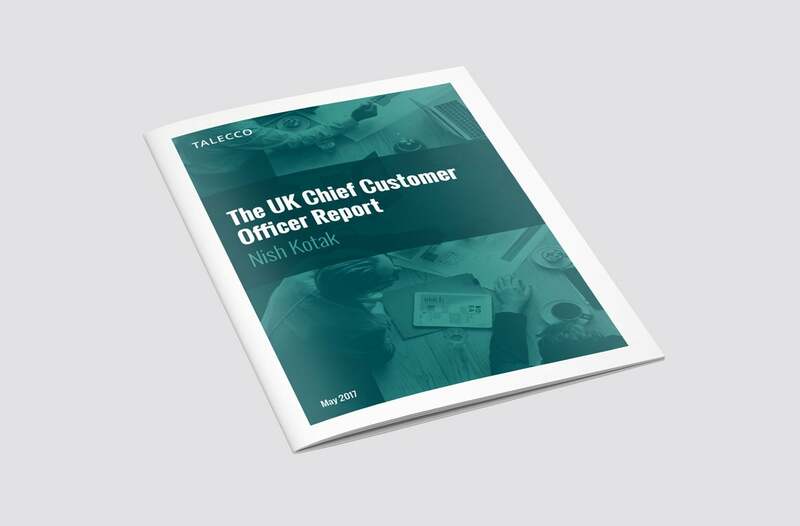 Talecco approached me to showcase the findings of their study into the rising need and popularity of Chief Customer Officers. 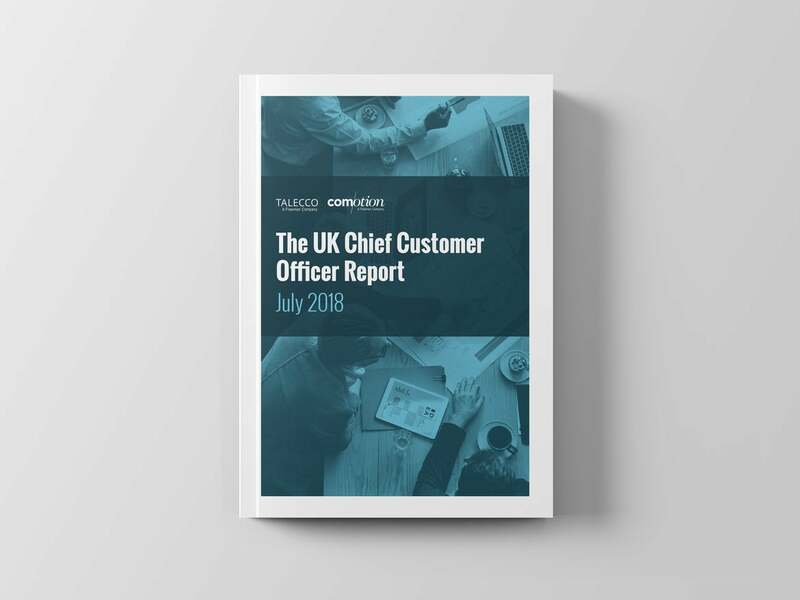 The aim of the report is to present the information in an attractive, easy to understand format that would appeal to decision makers at businesses who may hire CCOs, and therefore require the services of Talecco in assisting them with that hire. As part of this project I was asked to develop their branding style as I felt necessary to represent a forward thinking company of Talecco's calibre. 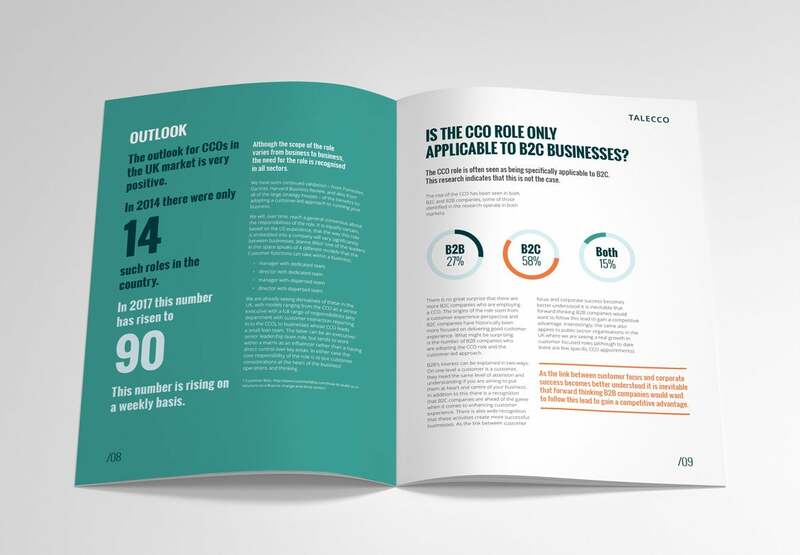 Having already created the first 16 page report and developed Talecco's branding style, the latest and bigger edition needed to look different yet retain a consistent feel with the first report. The typefaces and graphic elements are the same for both reports but I refreshed the colour palette for the latest edition. I moved away from the greens of the old edition in favour of deep blues and retained a contrasting orange. The headlines and pull quotes have been set in an impactful condensed typeface for a factual and solid feel, contrasted with the legible and approachable sans serif typeface chosen for body copy. I flooded pages with colour for contrast and to break up the content. 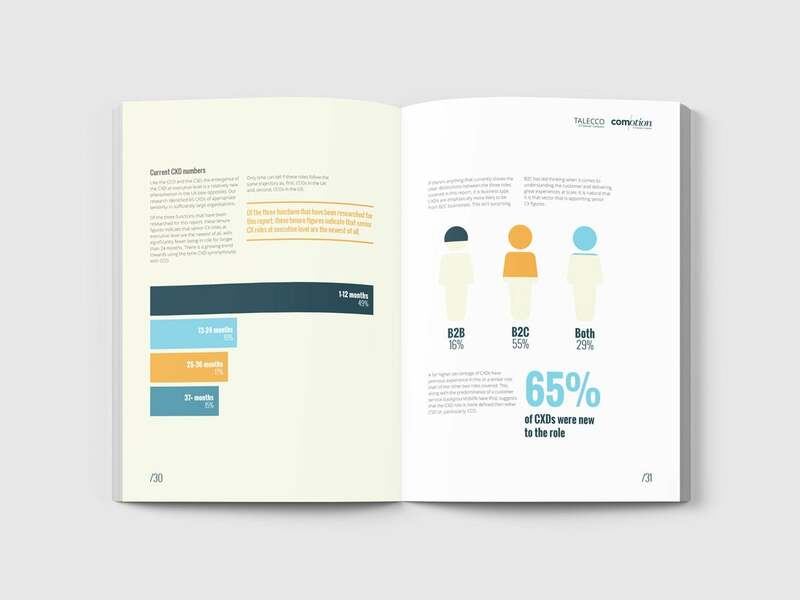 Horizontal bars add to the factual feel and draw attention to key pieces of information. 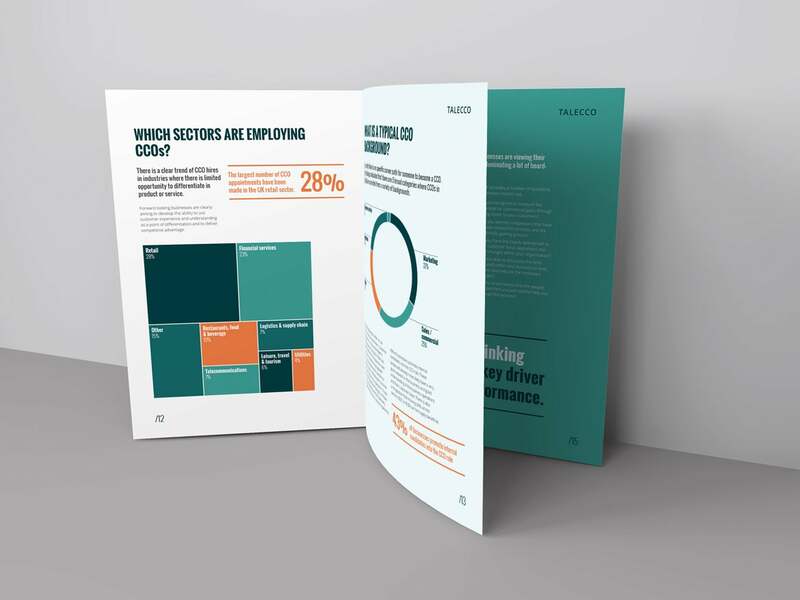 The figures have been highlighted through use of variety of charts and infographics, which also serve to pace the report and help break down the content into bite sized chunks. 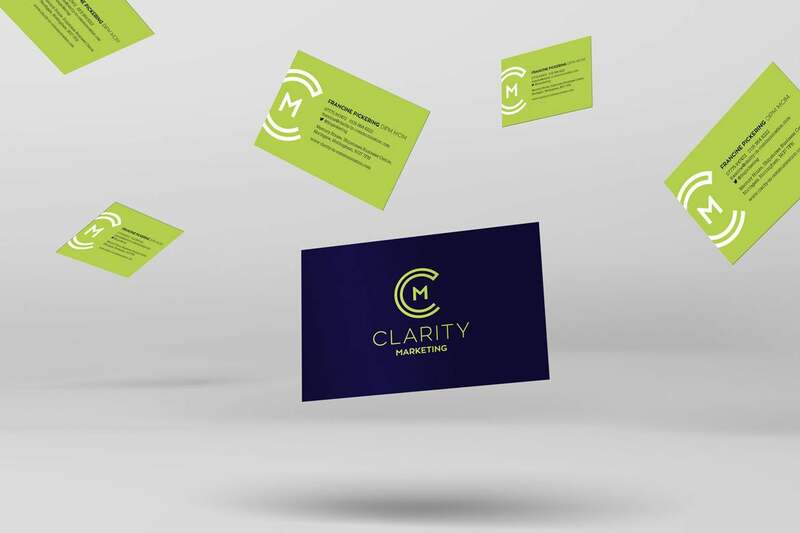 Francine at Clarity Marketing approached me to update the design of her business card. I asked her how old the design was and if she felt her logo represented her business. As neither the logo or card had been updated for a long time, I agreed to help her modernise the look. Francine is very experienced, accredited and, as Clarity Marketing, she offers a full range of strategic marketing services. Many of Clarity's competitors are offer purely digital marketing, without necessarily offering full strategic services. In light of this, I felt a monogram would reflect the classic aspect of Clarity's offering as well as Francine's expertise. I chose a geometric sans serif typeface to represent the digital services and up to date knowledge Francine has. The shapes are solid to symbolise dependability. The C is created from a circle, representing a complete service and double lines to give an impression of movement and action. One end has been left open to show flexibility – Clarity offers the services appropriate to suit the client’s needs. The colours are an evolution of Clarity’s old green and blue. The blue has been darkened to a navy for a rich, premium appearance with the green now a fresh lime for contrast and a modern look. The design for the business card was kept clean and simple to allow the logo to stand out. 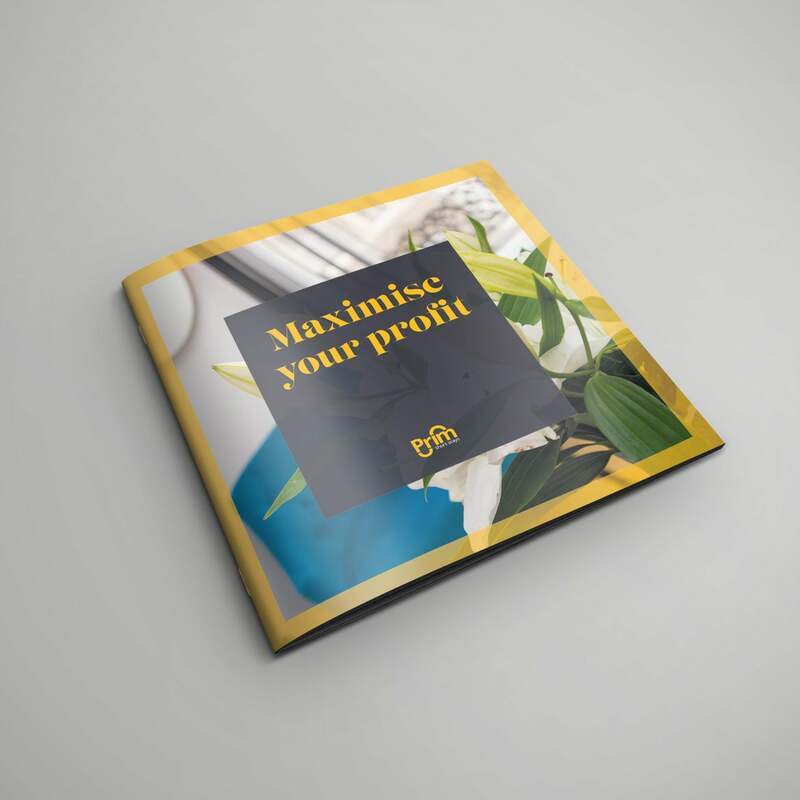 I was asked to create a leaflet as a mailer and sales tool, simultaneously refreshing Training for Business' branding to complement their logo. 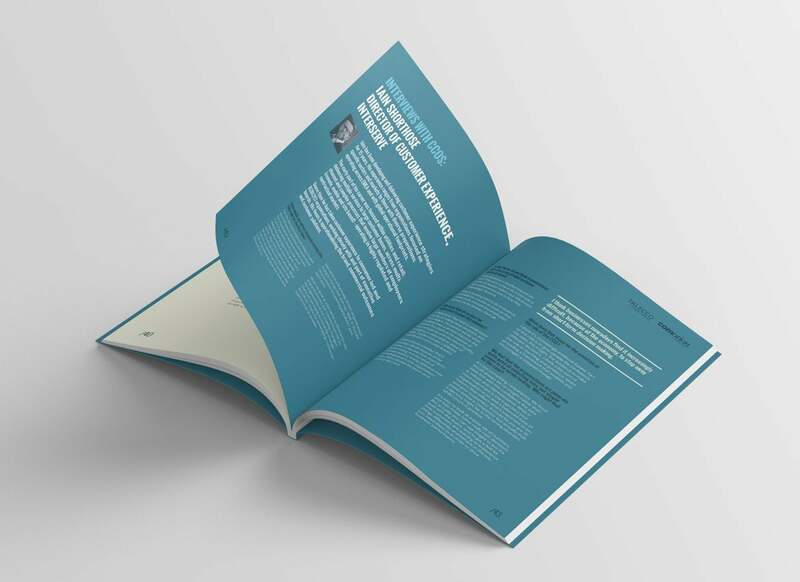 This leaflet is designed to inform SMEs of the benefits of employing an apprentice and working with Training for Business. Illustration was chosen because it offers flexibility and a point of difference from their competitors, who often use uninspired choices of stock photography. The figures are intended to be ambiguous to express TFB's variety of apprentices and qualifications available. In addition, this helps give the images longevity compared to using photos of current apprentices. Benefits of working with an apprentice and the skills they can bring to a business are highlighted in other illustrations.  The vibrant yellow and magenta from the logo have been used to give an energetic and fresh feel. In contrast, a dark blue and very pale blue have been chosen for a corporate and premium touch. The style of the illustrations is clean and geometric to for a straight forward, factual look. I've used the typeface in the logo for headlines, giving an approachable feel. I have selected a modern sans serif for the body text to compliment the curvy headline font and give a clear and direct tone. Key words in the headlines have been highlighted in pink or yellow for emphasis and interest. The overall layout is simple to allow the imagery to stand out. 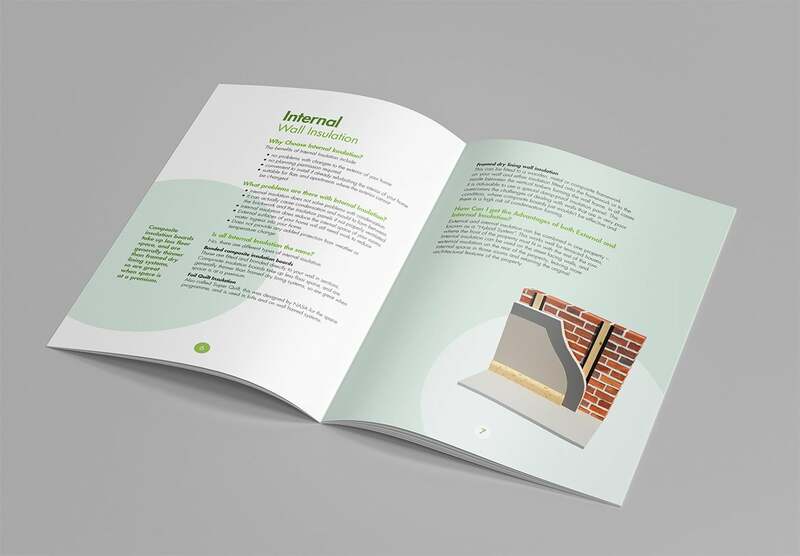 Spot UV has been used on the cover for a tactile and premium finish. 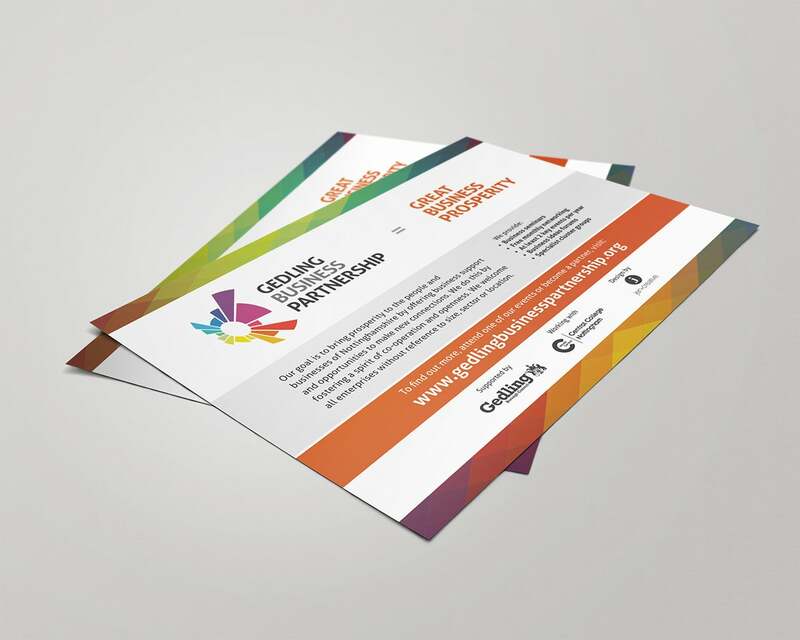 Gedling Business Partnership offer networking, seminars and other business support for all companies, not just in Gedling but also to the surrounding area. I was asked to create a new logo for them. Like the keystones in an arch, the wedges represent how businesses work together within GBP. The different sized wedges represent the variety of businesses, members and services of GBP and that together, they are reaching out to achieve and exceed their goals. The wheel has been distorted with perspective to add movement and energy. A clean but slightly rounded font has been chosen for its solid yet approachable feel. The flyer was given out at events to raise awareness so it had to be eye catching. 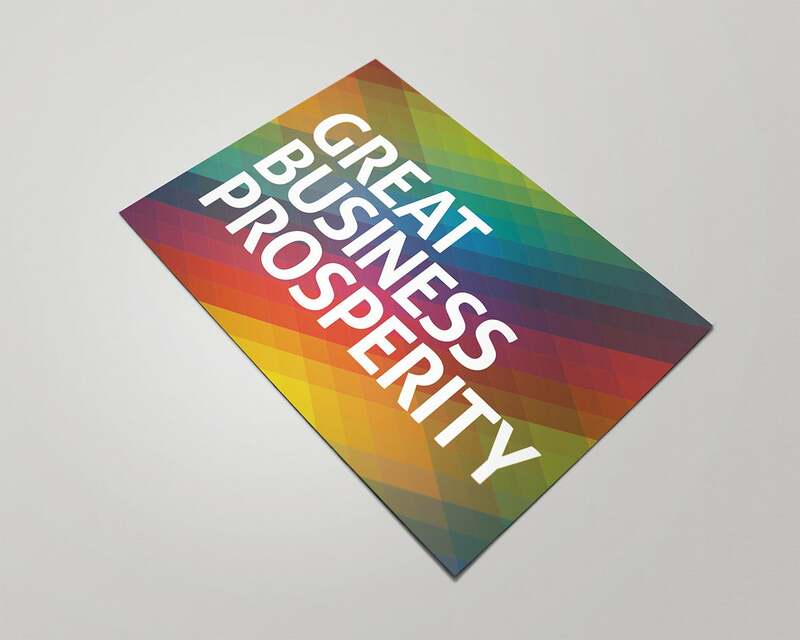 GBP’s management team had realised GBP could stand for many phrases as well as Gedling Business Partnership so I chose one that I felt would resonate most with business people. I paired it with the bright colours of the logo for maximum impact. 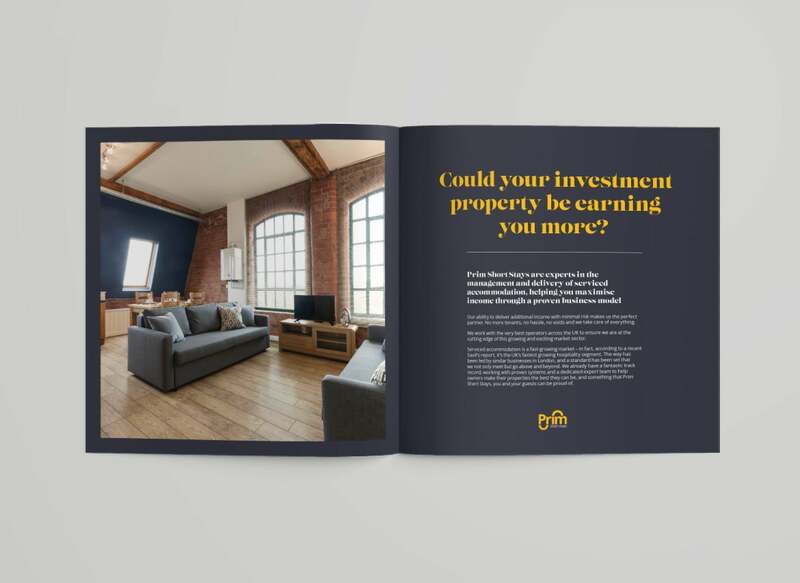 Including little information on the front was intentional to encourage the recipient to turn over and read about what GBP offer. Body Aspect asked me to design a flyer that would attract individuals on weight loss programs to use their 3D image capture technology to track their progress. Muscle weighs more than fat so when combining exercise with a healthy diet, it's common to see little change in weight yet the shape of that individual's body will be changing substantially. Consequently, relying on weight alone as a measure of progress can be demoralising. However, with Body Aspect's image captures, individuals can compare, in 3D, what their bodies look like before and during health regimes, boosting motivation. Using their existing logo as a starting point, I selected a colour palette of urban, modern shades to give drama and reflect the state of the art technology being used. Angles and blocks in the layout add to the edgy feel. The blocky sans serif headline typeface enhances the scientific feel. I chose the image on the front to give a sense of anticipation and action. 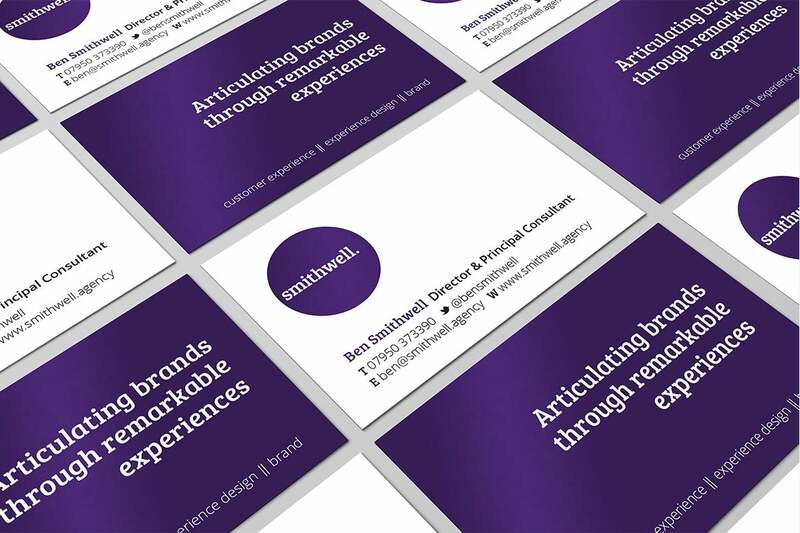 Being a brand and customer experience business, Smithwell were keen to get their branding right. They required a total brand update to reflect their new name and wanted a more ‘agency’ feel. Having set their heart on a wordmark rather than an icon based logo, I was chosen to create the design, not least because they call me the “font queen” due to my typography obsession! I chose a modern, approachable, slab serif font and set the letters in lower case to enhance the open and friendly feel. The full stop has been included to say to potential clients that they need not look any further for a customer experience specialist. 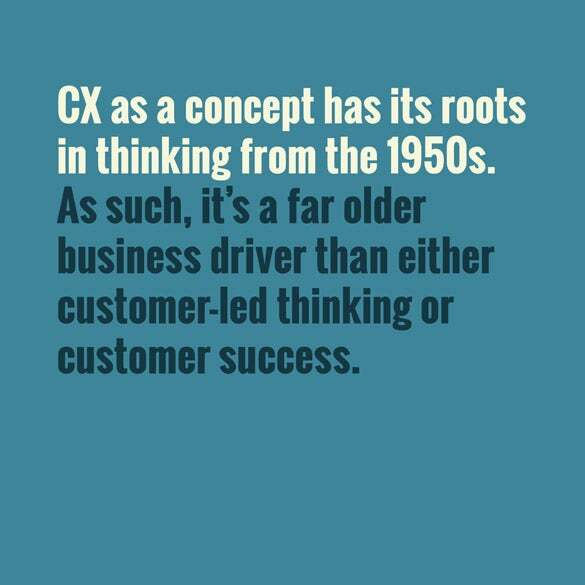 The circle echoes this and reflects the complete service Smithwell provide. The purple has been chosen as it denotes creativity and a bit of playfulness. The shade is rich to give a mature and premium feel. The business card design and simple sans serif secondary typeface have been chosen to complete the clean, straightforward look and allow the primary typography and logo to take centre stage. 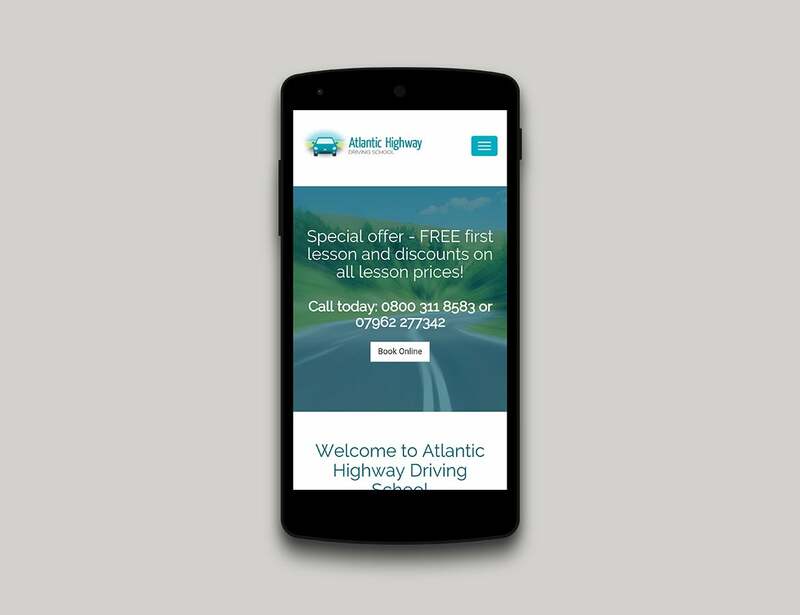 Atlantic Highway are a small, independent driving school based in North Devon, near the Atlantic Highway section of the A39. 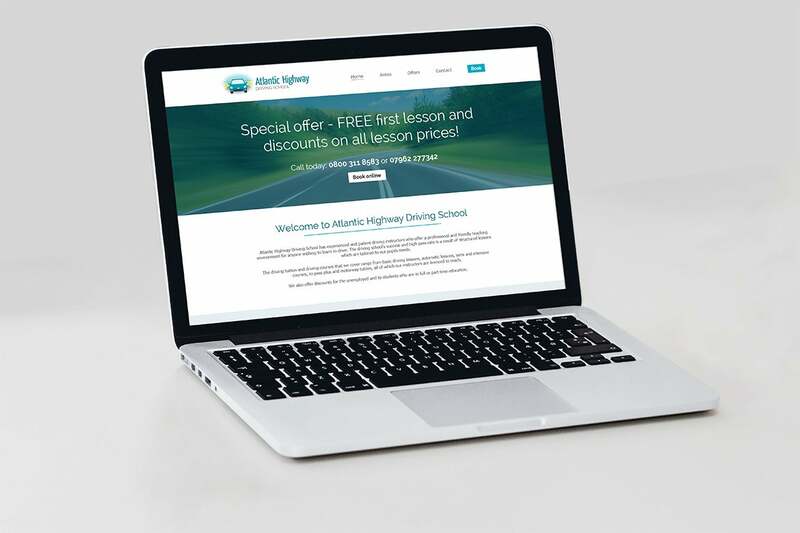 In contrast to the cliché images of L-plates and happy pupils holding car keys used in their local competitors’ branding, I chose to show a landscape with an open road both in the logo and on the website imagery. This represents the freedom pupils gain when passing their driving tests. The aqua blues and fresh greens express positivity, ‘go’, safety and link to the Devon landscape to show this is a local, friendly driving school. The car in the logo makes it clear what kind of business the logo is for and the simple shapes give a modern, clean feel. The website has been designed to be clutter free and simple to use, further reinforcing the impression that Atlantic Highway are easy to deal with. I manipulated stock imagery to highlight three key offers and continue the aqua blue theme. Cobalt Carbon Free offer house improvements and renovations to enable homeowners to have warmer, more energy efficient homes. Gaining trust can be a big challenge for businesses in the trades as consumers have become worried about inadvertently employing a ‘cowboy builder’. 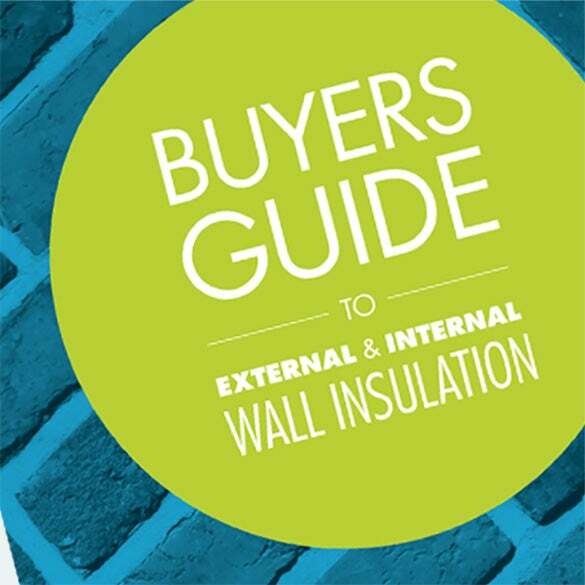 To help overcome this, I was commissioned to design a buyers’ guide, educating homeowners in what they should know when purchasing wall insulation. The intention is that Cobalt Carbon Free would then be positioned as experts in their field, building trust with customers. The guide needed to appear inviting and easy to understand so I broke the content up into bite-sized chunks. 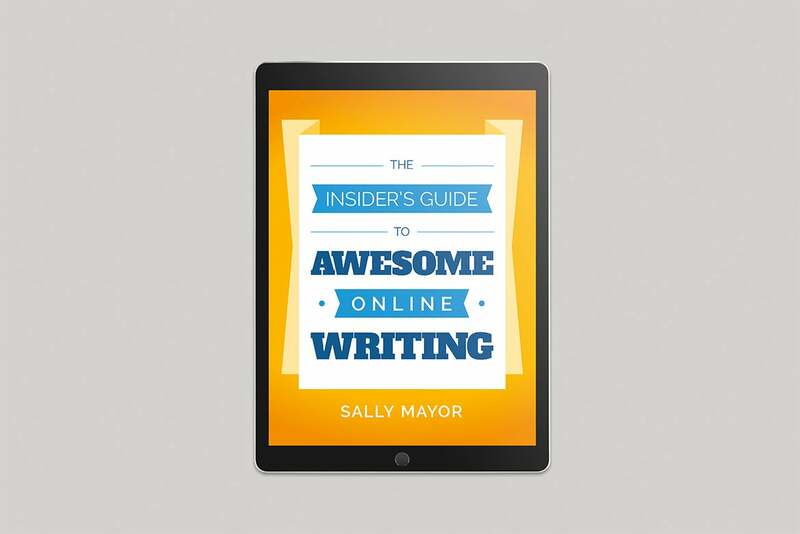 I used colourful headings, wide margins, indented bullet points, pulled out quotes and coloured pages to achieve this. 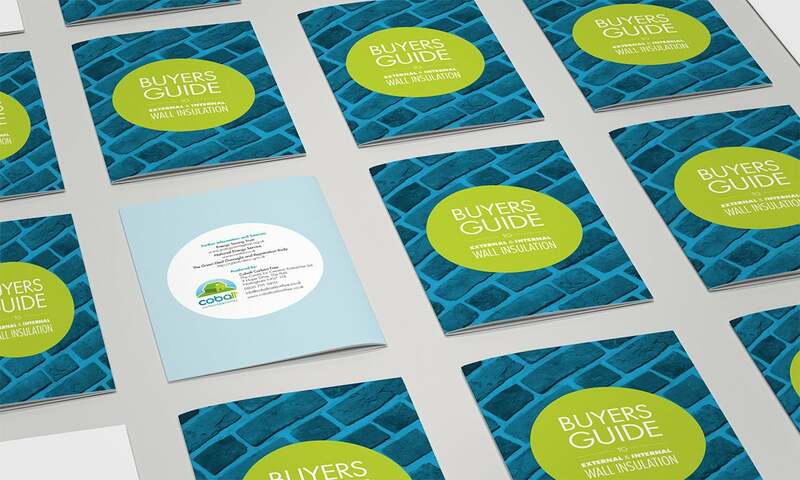 The circles also help add variation and link to the logo, which is only seen on the back cover as the guide is intended to appear impartial. WordNerd wanted to market their copywriting services to a database of email contacts and chose to send an e-book. 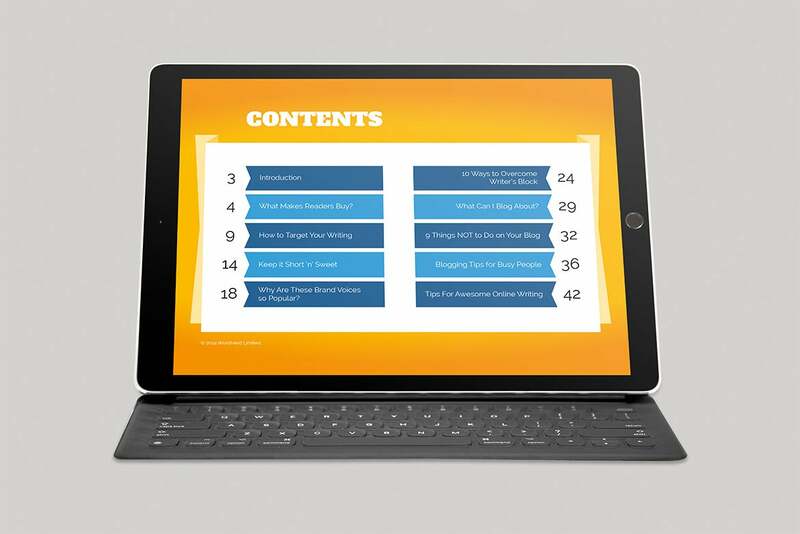 The book was to contain a compilation of their blog posts but needed some visual templates to bring it all together. To grab the recipients’ attention, encourage them to open the e-book and read it, I realised this job needed to be high in visual impact. I therefore used large amounts of WordNerd’s blue and orange for contrast. Although there were already pictures from the blog posts for the articles inside the book, there wasn’t anything specific set for the cover. As WordNerd works with words, I chose to create a cover image from words. 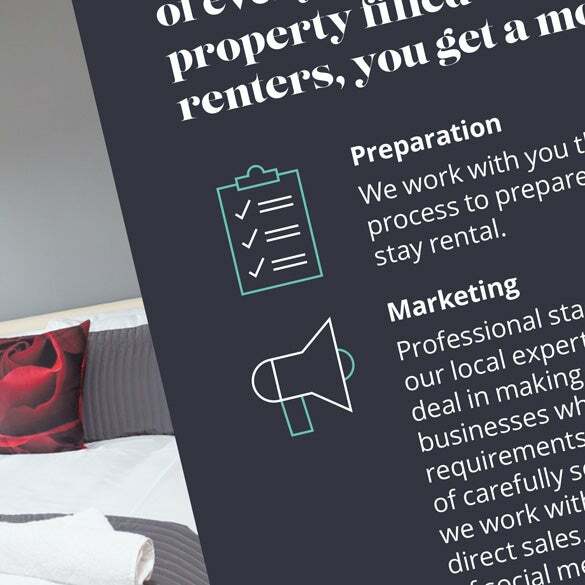 The choice of typeface was open to me so I selected a chunky, bold, slab serif font and softened the look and added contrast by pairing it with a clean, rounded sans serif. When choosing the fonts I was careful to choose ones that are free for WordNerd to source for inputting the content into the templates.